The phone rang to wake us at 4:15 a.m. and we were loaded into a van about a half hour later for our sunrise hot air balloon ride over this city. Still in the dark, we arrived at the launch point and met our pilot, who, after explaining the crash landing procedure, assured this American not to worry — we would have a safe trip! As the sun broke across the horizon, we loaded into the basket and with a couple blasts of neck-hair burning gas blasts, were off. 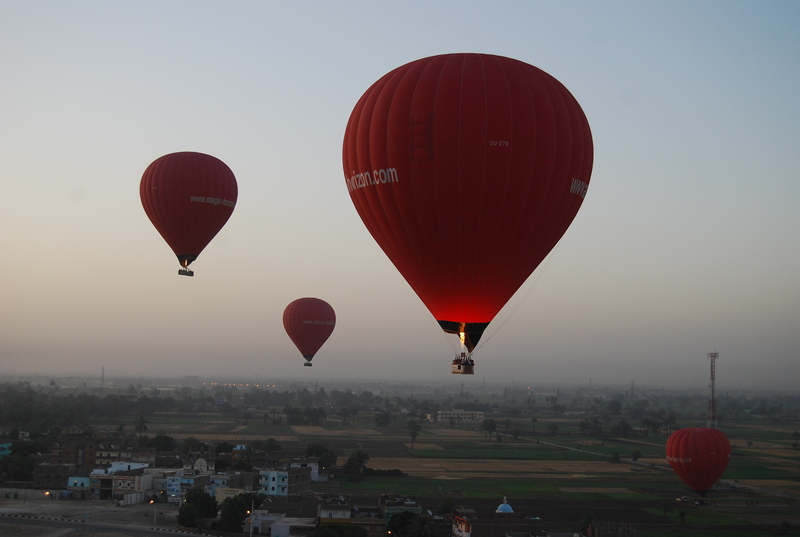 The sky soon filled up with dozens of other balloons. 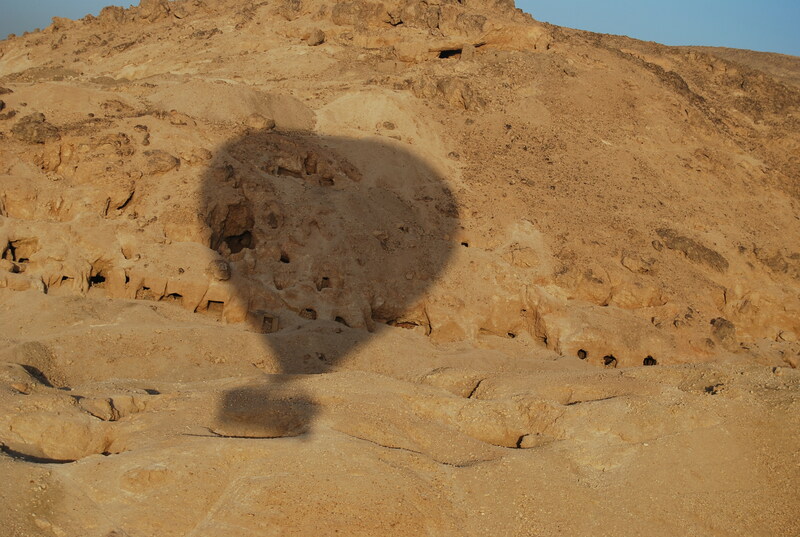 The wind brought us to the Valley of the Kings, a collection of tombs, including that of King Tut, discovered by the British in the early 20th century. Instead of building pyramids here, the Egyptians placed these tombs in the large hills and mountains that dot the Nile’s west bank. 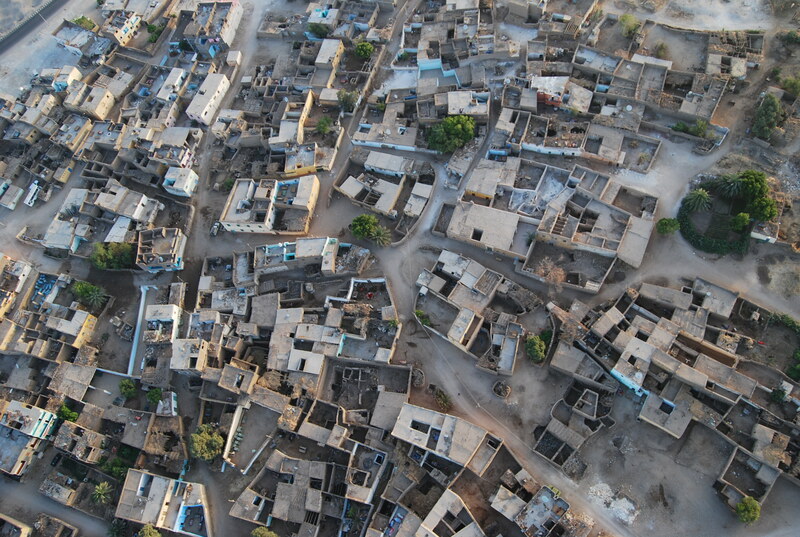 We passed over many rundown homes — often without roofs — which offered an interesting perspective of the many Egyptians still asleep in bed. On our way down, we narrowly passed by some areas where treasure hunters had previously dug in search of other lost tombs. After we landed, we went for a walk through the Valley of the Kings and saw the highly decorated and colorful tombs of Ramses IV, Ramses III and Ramses I, and then had a quick lunch before heading over to the Winter Palace, the swankiest place in town, for some pre-departure cocktails on the patio. 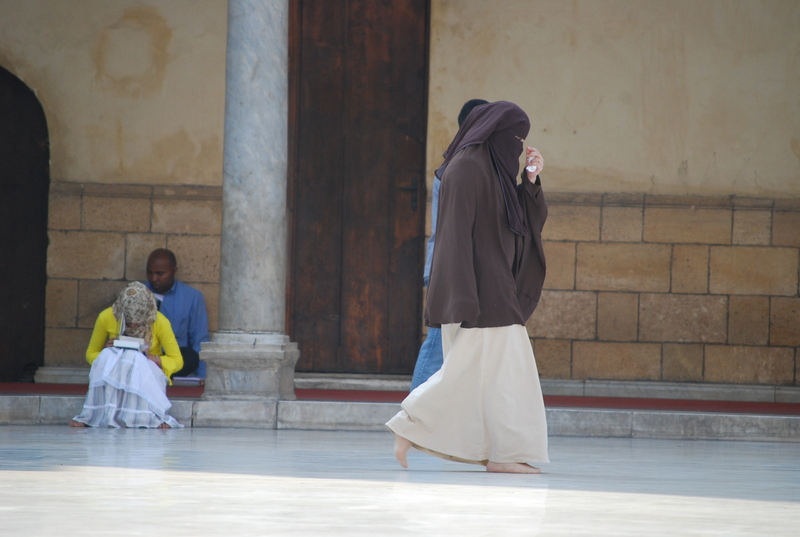 The last week of Egypt’s sun, food and constant harassment have been exhausting. But the sights and the people that I’ve met on the Intrepid trip have been pretty amazing. Like Morocco, I’m not sure whether or not I’ll return to this country. But if my memories of Egypt are only of this week, I’ll be more than content. Our overnight train back to Cairo departs in several hours. My flight to China leaves tomorrow afternoon, with a 9-hour layover in Dubai. The sun awoke us early this morning and by 6:15 a.m. we could already feel it burning our skin. They anticipated temperatures at 115 degrees fahrenheit today — and that prediction might have been on the conservative side. 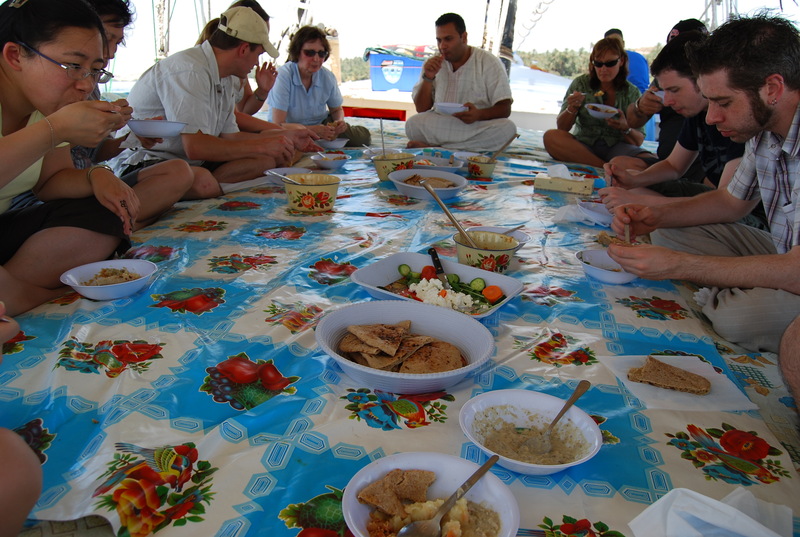 We had a quick breakfast, gathered our bags and bid farewell to our felucca captains at the pick up point. 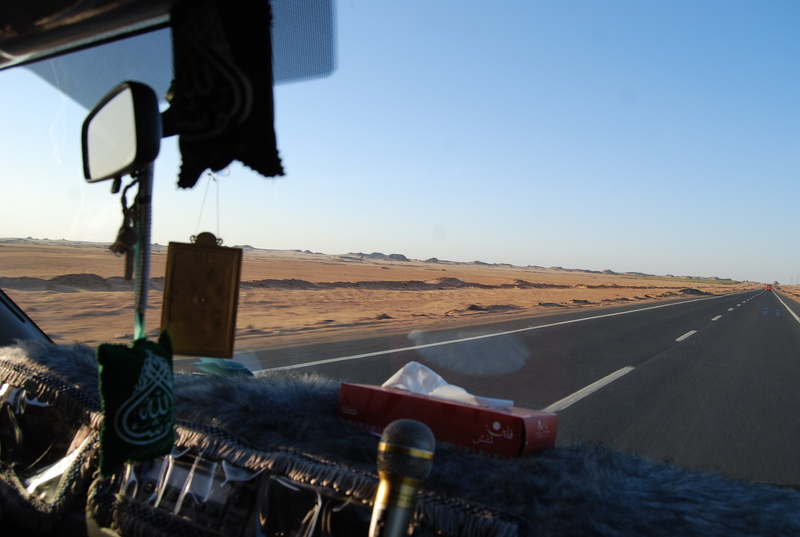 Our 3-hour bus ride to Luxor was another white-knuckled police-escorted convoy. We somehow managed to luck out again with a driver who pushed his minivan to absurd speeds but was defensive at the same time. We arrived here at around 11:30 a.m. — all it took was one step off the bus and the dry, stifling air was suffocating. 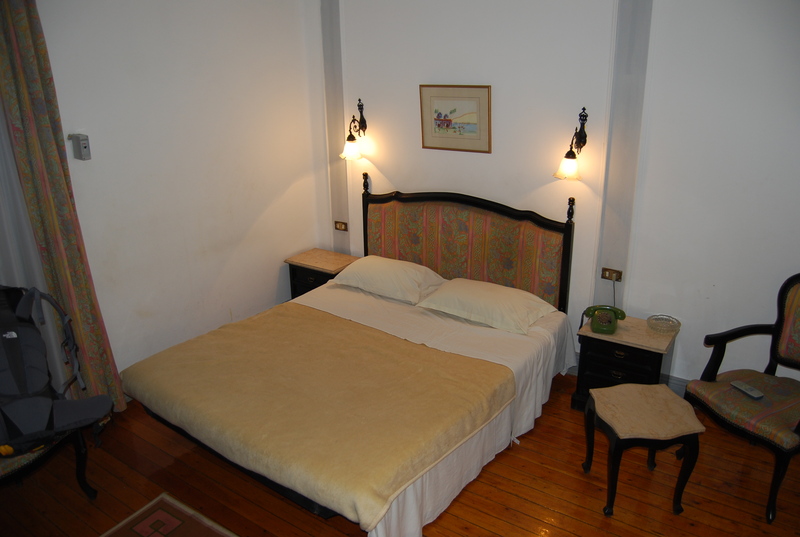 We’re staying at the Little Garden Hotel, a small and clean family-run place. Our room offers a view into the heart of the city. This is Luxor, Egypt. 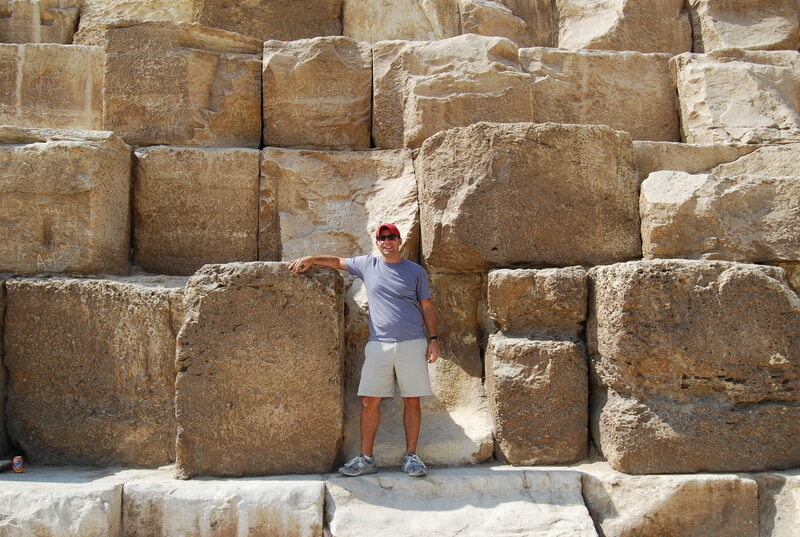 We had a quick lunch and then headed for the Karnak Temple, the largest in the world. 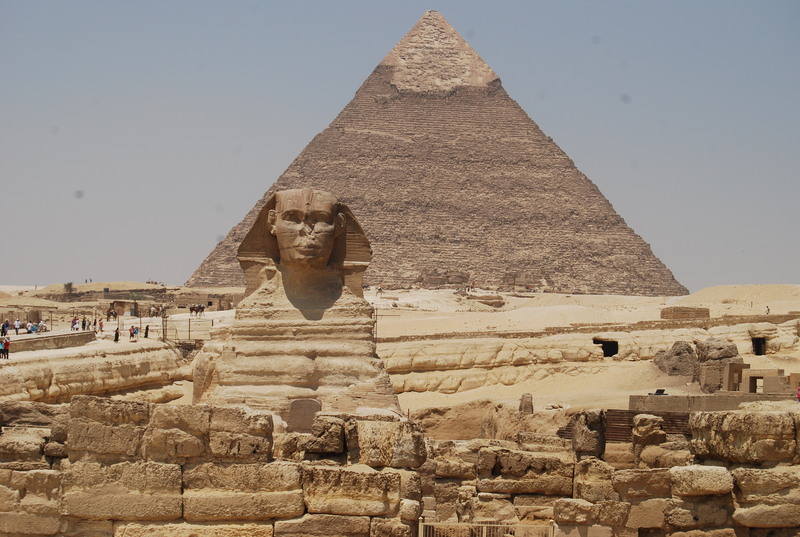 It was built over 400 years as the capital of the New Kingdom. 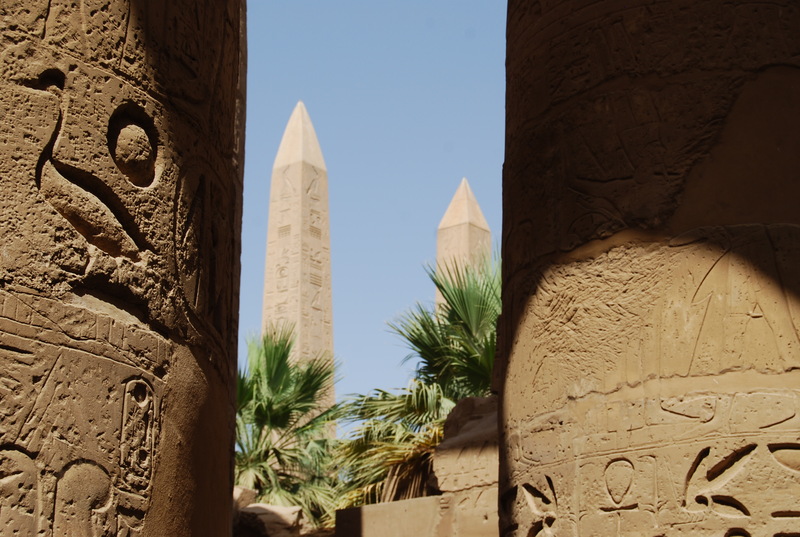 There was an overwhelming number of obelisks, columns and carvings. Unfortunately, the stone structure was radiating heat and the sun was just too stifling to stick around for long, so we hopped back in the van and grabbed an ice cream at America’s greatest contribution to the world. We’re having a dinner and belly dancing show at the hotel tonight and then turning in early. It’s been an exhausting day, the food and sun are beginning to take their toll on us, and we start at 4:15 a.m. tomorrow. 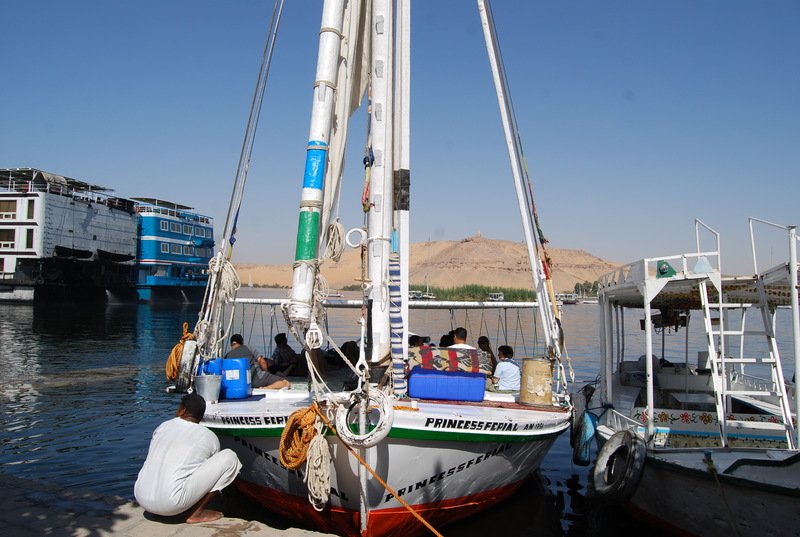 With temperatures topping 110 degrees today, it was a relief to board our felucca, Princess Feria, at around 10 a.m. for a sail up the Nile River. Feluccas are traditional Egyptian single deck sailboats that have been used for thousands of years — they have simple rigging systems, huge masts and plenty of space for lounging. After a couple of hours, we passed underneath one of the few bridges connecting the river’s east and west banks and were then treated to a freshly prepared, and quite delicious, vegetarian lunch on board. About 30 km up stream, we stopped at a small island and tied the boat for the evening. 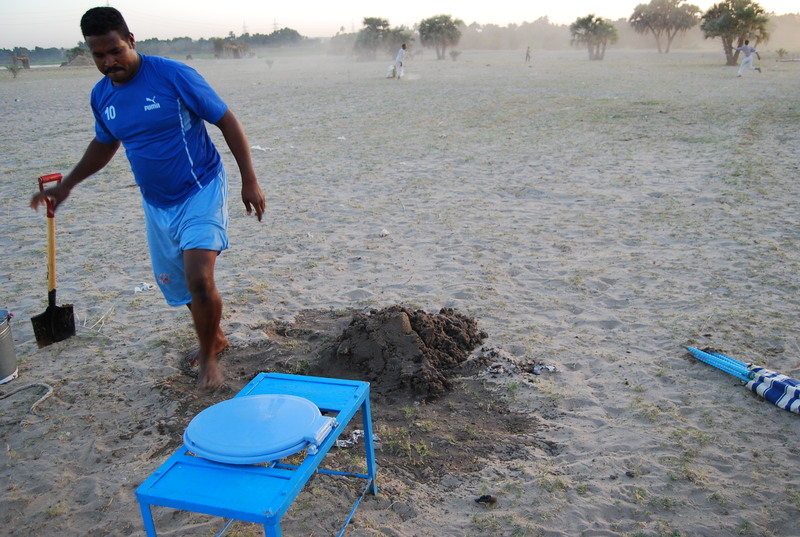 While local Nubian farmers challenged some western tourists to a football match, we dug a toilet (exciting! 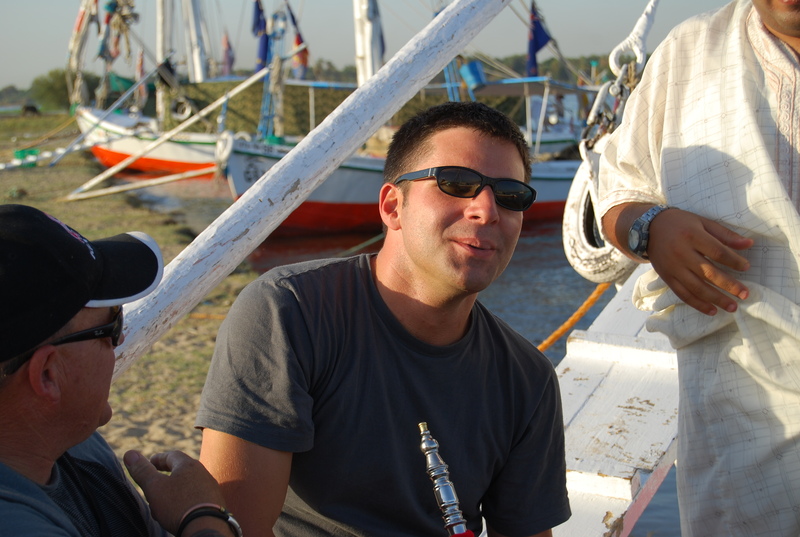 ), fended off dogs from stealing our sneakers (scary) and broke out the sheesha (relaxing). Walking around afterwards, we found rubbish absolutely everywhere. The Egyptians consider the Nile River their lifeline, without it, much of this country would simply be desert. This doesn’t stop them, however, from dumping full garbage bins directly into the water — or, sending hundreds of cruise ships up and down the river while diesel fumes and exhaust cloud the skies. Through all of this though, we were able to witness an absolutely spectacular sunset. After some dinner, the locals built a couple of campfires and then danced and sang some traditional (and not so traditional) songs. We drank a couple of Stella beers back on the boat and fell asleep under the stars. 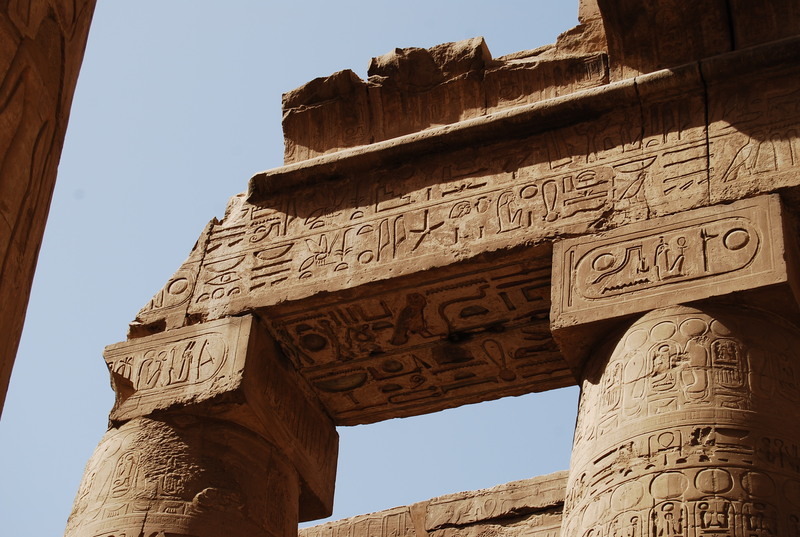 Without working phones in the room, our wake-up door-knock came this morning just before 3 a.m. Running off about 4 hours of rest, we assembled half-asleep in the hotel lobby to board our bus to Abu Simbel. 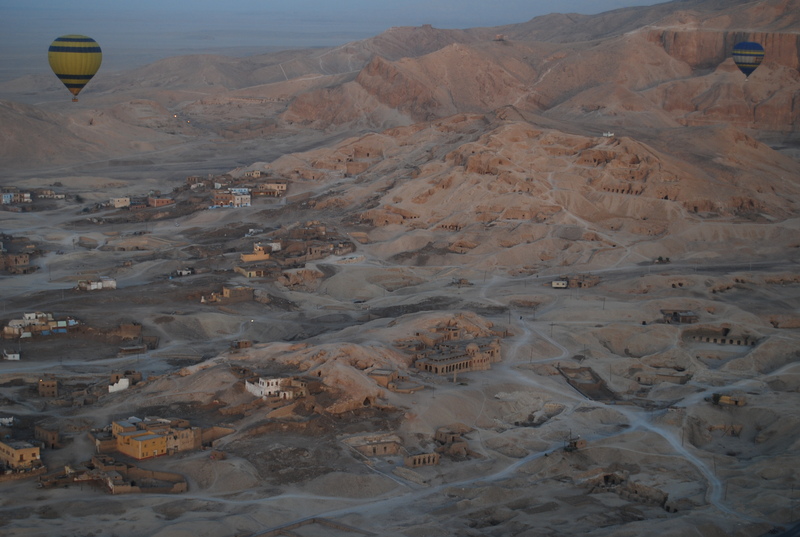 Since a string of terrorist attacks about a decade ago, the Egyptian government has required that all visitors to this village — home to the Great Temple of Ramses II — travel in a police-escorted convoy that departs each morning at 4 a.m.
We arrived at the assembly point about 15 minutes later and joined an ever-growing line of tour buses. The police gave our van a quick look and wrote down our license plate number. This is the last we would see of them. In reality, these mandated convoys serve little purpose — without any protection, they are nothing more than moving targets that leave every day at the same time and follow an identical predetermined route. It could even be argued that the convoys are actually more dangerous, as bus drivers demonstrate their machismo and push their vehicles as fast as they can go. 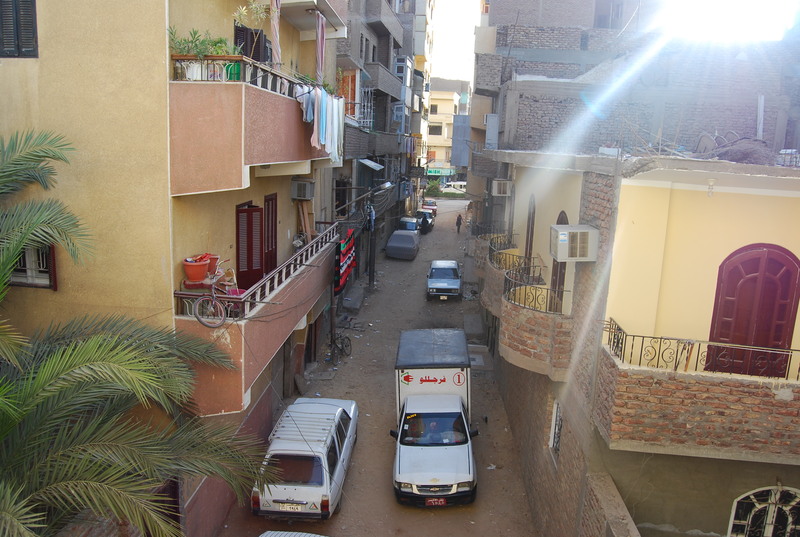 Around 4:30 a.m., we boarded our van and were instantly part of a 30-bus race through the streets of Aswan. Our driver has to be given credit for his somewhat defensive tactic, especially when navigating the sand-dune covered roads beyond the city center. The same can’t be said for others, including the large motor coaches that roared past us at over 100 m.p.h. My spot in the “suicide seat” offered a good vantage point after the sun came up, watching the Sahara whiz by. Three hours and several military checkpoints later, we finished in about 7th place at Abu Simbel (at one point, we were in first — if this were Amazing Race, I’d be devastated), bought tickets and hustled to the Temple. We somehow managed to get down there before all the big tour groups, and for just a couple of minutes, had the whole place to ourselves. The Great Temple of Ramses II was built into the mountainside on the west bank of the Nile River between the years of 1274 – 1244 B.C. This had to have been a tremendous feat of engineering at the time, each statue is about 20 meters high and carved from a single block. We walked deep into the darkness and found the sacred sanctuary. 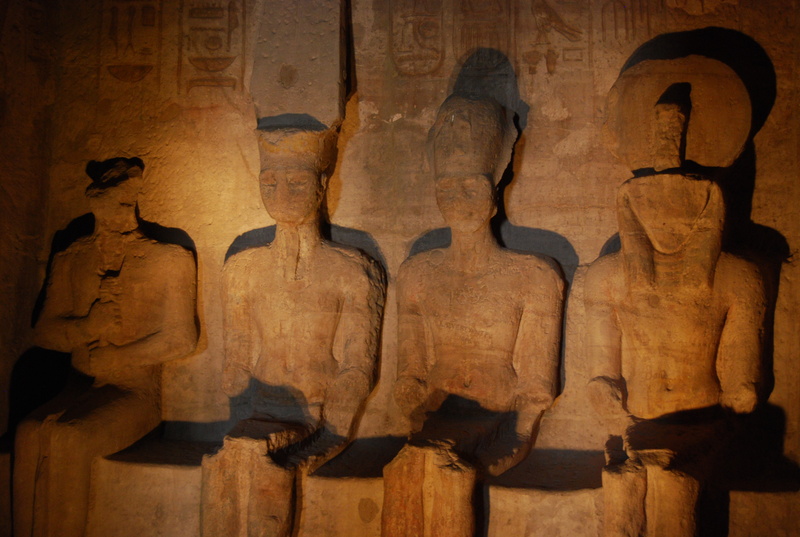 On two days of the year, February 22 and October 22, when Ramses was born and assumed the throne, the sun shines in such a way that the inner-most chamber is flooded with light. It is pitch black on every other day. 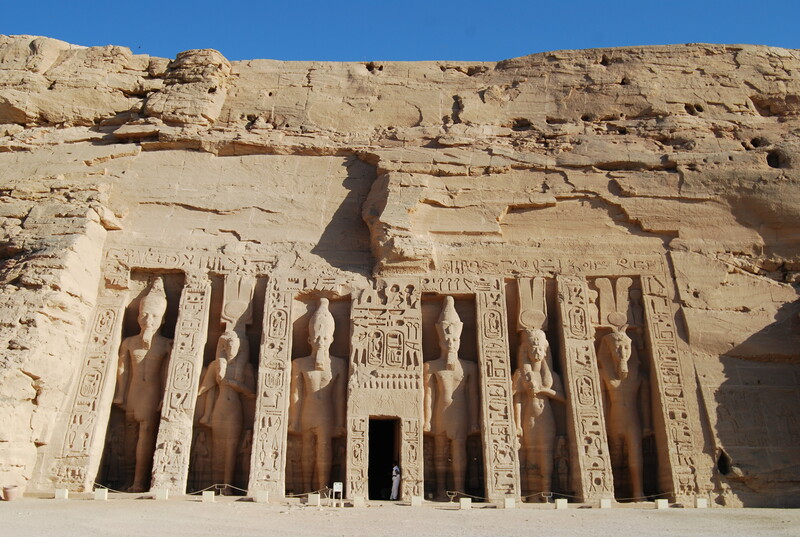 Next door, Ramses built the Temple of Hathor, a comparatively smaller sanctuary for his wife. The intricacy and size of its design are equally as impressive. At 9:30 a.m., with the sun starting to rise and the mercury quickly following, we got back on the bus for our trip back. It’s hard to say if the return ride was just as harrowing — most of us were immediately sound asleep. 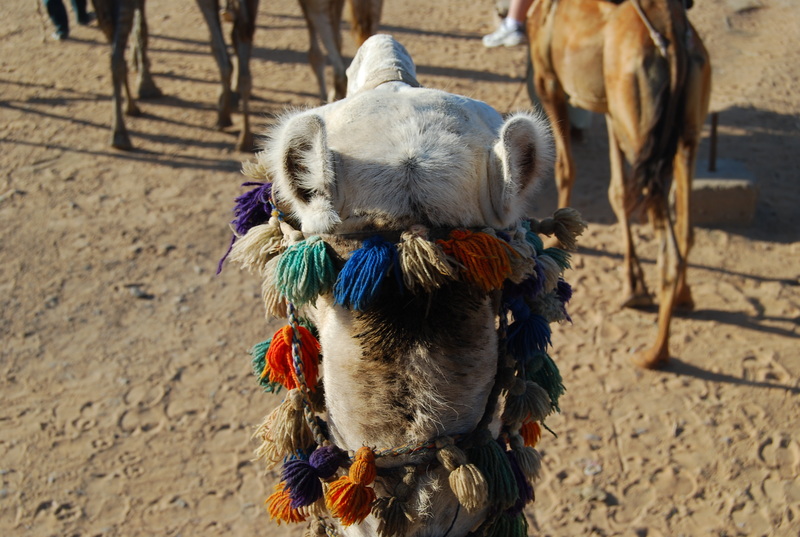 We had the rest of the day to walk around the Aswan markets and rest at the hotel; with temperatures here well around 100 degrees fahrenheit though, the latter was much more appealing. Tonight, our last in this city, we have a nice group dinner planned. 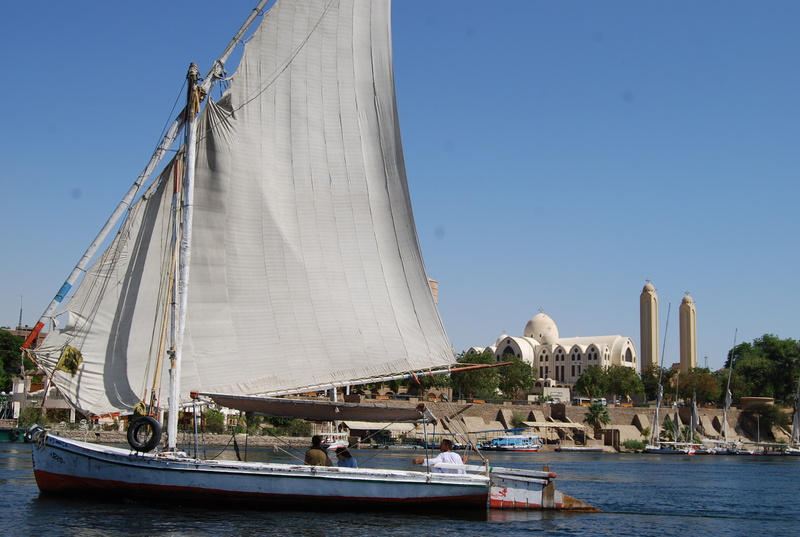 Tomorrow, we take our felucca for a day’s sailing trip up the Nile to our next stop, Luxor. Besides arriving over three hours late, our overnight sleeper train to this city of about half a million was actually quite comfortable. The tracks followed the Nile River the entire route — when dawn broke, the importance of this water source in Egypt became crystal clear. On our right were irrigated farms, lush with vegetation. And, on our left was the arid desert, completely desolate of life. 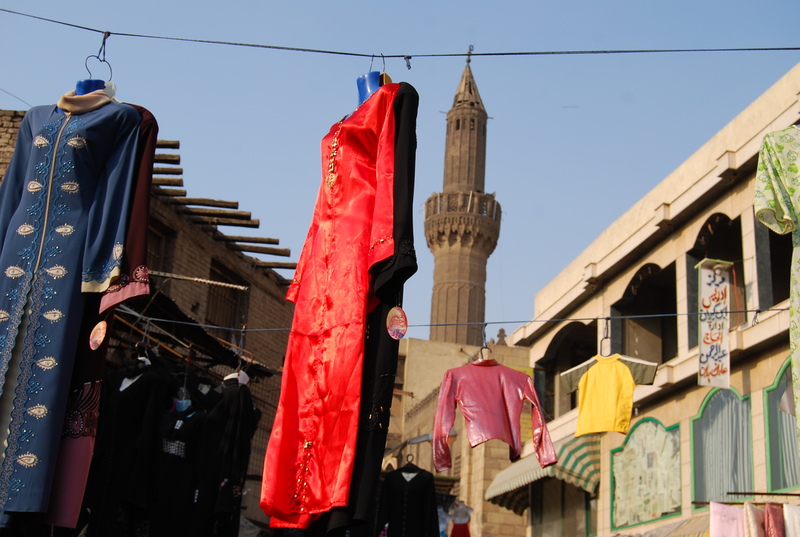 Aswan, a city perched on the east bank of the Nile, is the last major stop in this country before the Sudanese border. 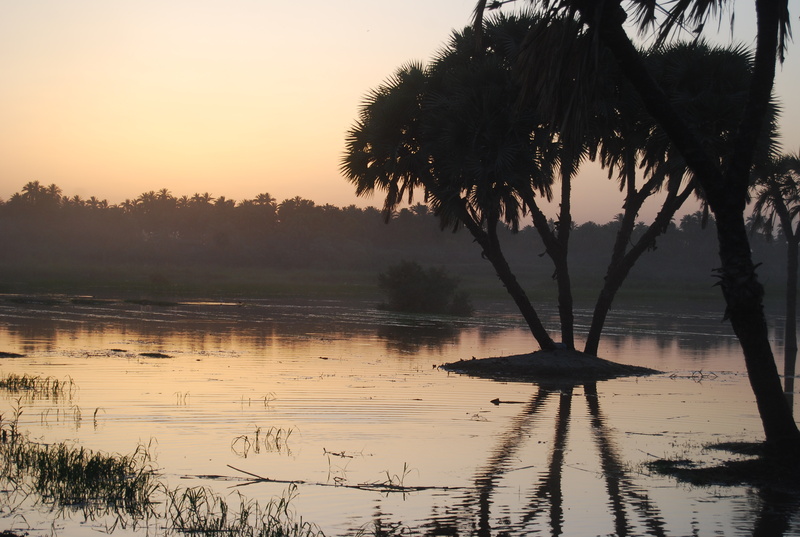 After arriving in the filthy train station, we grabbed our backpacks and walked to our new home: the Nuba Nile Hotel. Between fourth floor rooms, out-of-service elevators and no water pressure, it is easily the dumpiest accommodation that I’ve had in 40 days. It certainly does not qualify as a 3-star hotel (per Intrepid’s promise) — and has me longing for bygone days. Without anything we could do about it, we hopped on a small bus and headed to the High Dam, which was responsible for creating Lake Nasser, the world’s largest man-made lake. 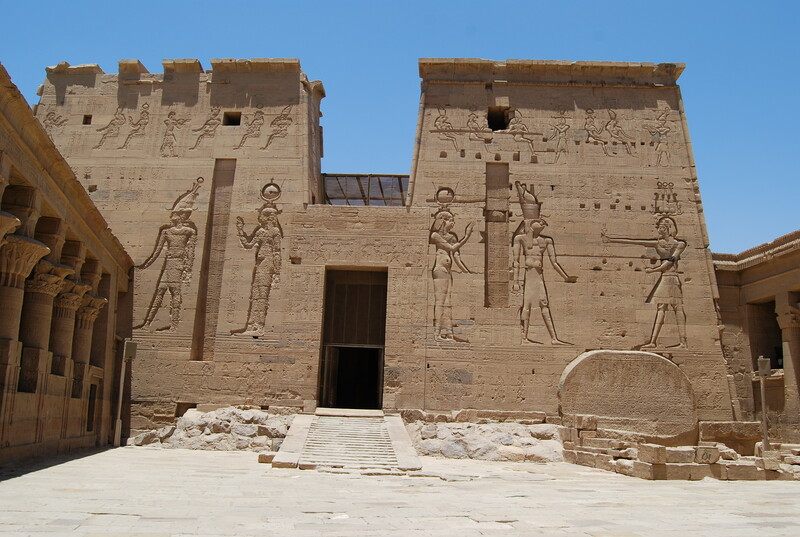 Afterwards, we took a boat to Agilika Island to see the Philae Temple, which looks straight out of Indiana Jones. It’s an amazingly well-preserved place and walking through it with our guide, we essentially had it to ourselves. 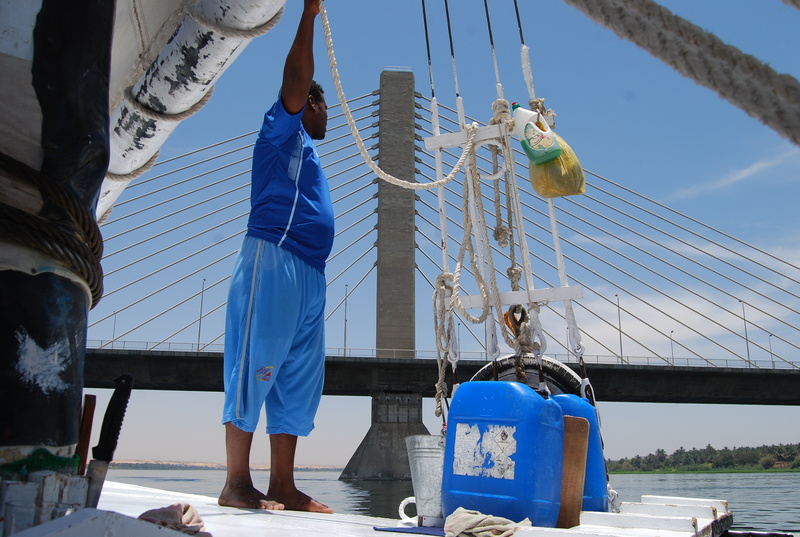 We returned to the port and boarded a small motor boat for an introduction to the Nile, the world’s longest river. Its waters are crowded with cruise ships, small day boats, canoes and feluccas, the Egyptian sailboats that we’ll be taking on Wednesday. Hamdi, a Nubian elder, pointed out the significant monuments lining its banks and also explained how the High Dam displaced his village — before taking us on a tour of Elephantine Island, where they have now resettled. We docked where the world’s longest river meets the world’s largest desert (the Sahara). After climbing a dune, it was time to pop open a refreshing, locally-brewed Stella beer. A camel ride brought us to the Monastery of St Simeon, said to be one of the best-preserved of the original Christian strongholds in Egypt. Oscar provided a bumpy, yet spit-free, ride. Exhausted, we returned to our lovely abode to rest up. 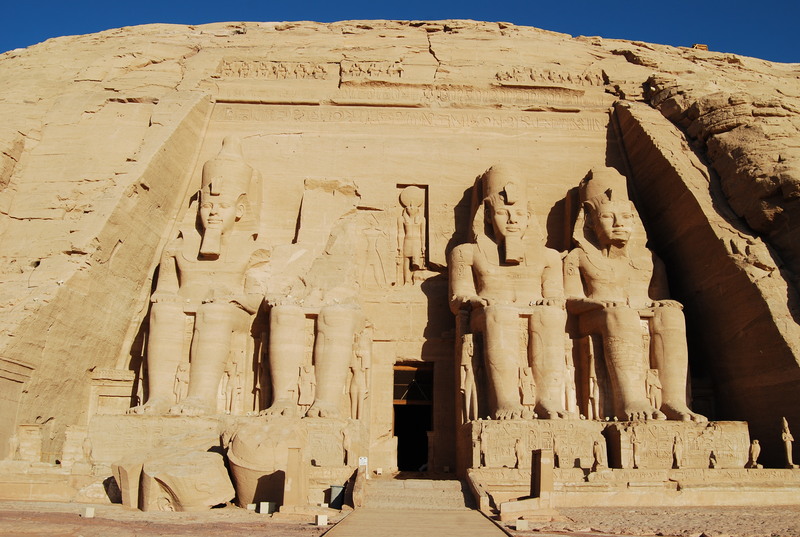 We leave tomorrow morning at 3:30 a.m. on an escorted police convoy to Abu Simbel, home to the Great Temple of Ramses II. 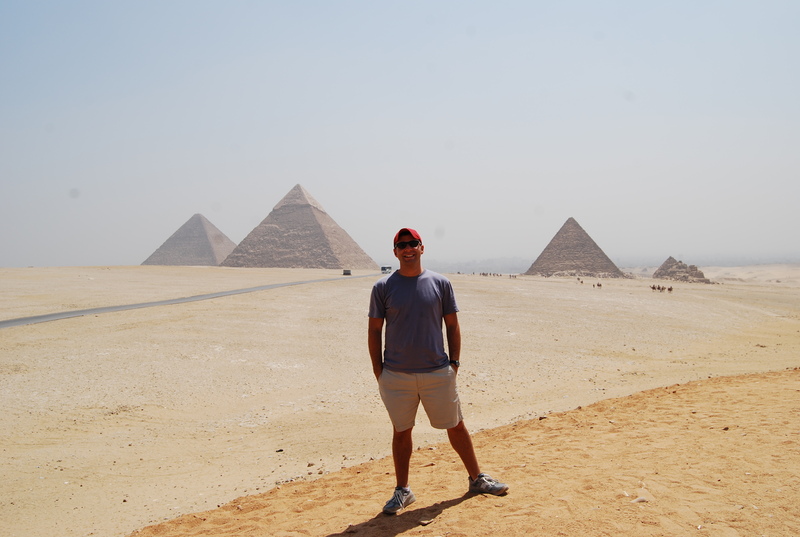 My “Egypt Adventure” trip with Intrepid started this morning. It’s a small and diverse group of 12 travelers from around the world — ranging from some young U.K. solo travelers to a well-traveled New Zealand couple — with yours truly the only one representing the U.S. of A. We met our guide, Hany, who will be with us for the next 8 days. He provided some background on this city of 18 million — about how the majority of Egyptians live on less than 300 pounds, or $60USD, a month — as well as some tourist etiquette on the Art of Bargaining (even after you’ve got them down 50%, they’re still making a hefty profit) before we jumped in a couple of taxis and saw what this city had to offer. 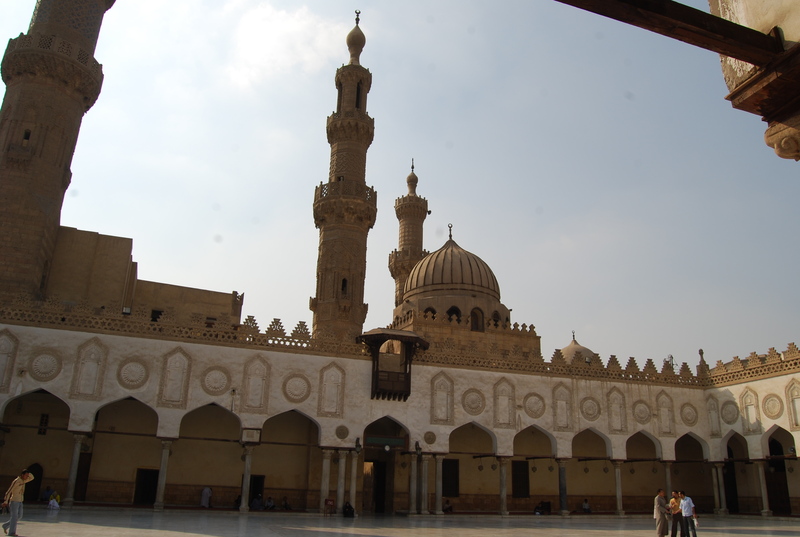 We made our way to Islamic Cairo and the Al Azar mosque, which built in the first century, is the 4th oldest in Egypt. 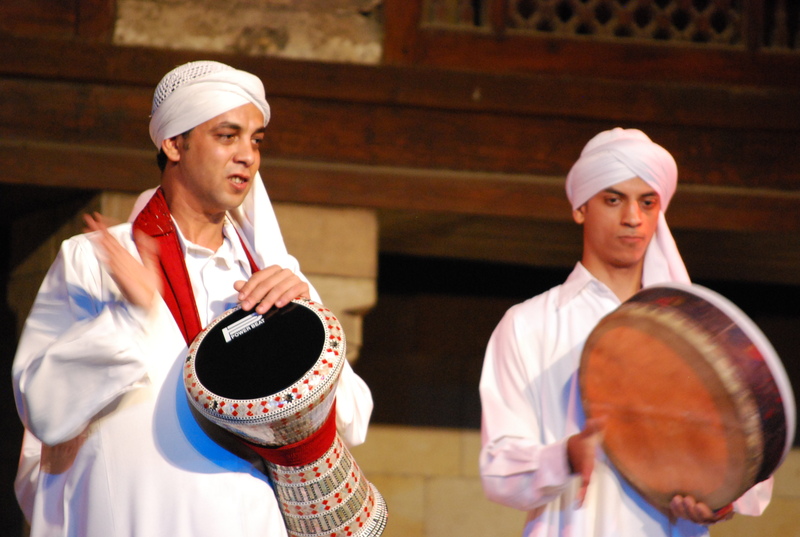 It has since become one of the largest Koranic teaching schools in the country. As we made our way through the courtyard, the call to prayer sounded through the minaret’s speakers above us and worshipers flooded in. I’ve seen markets in Morocco and markets in Turkey. 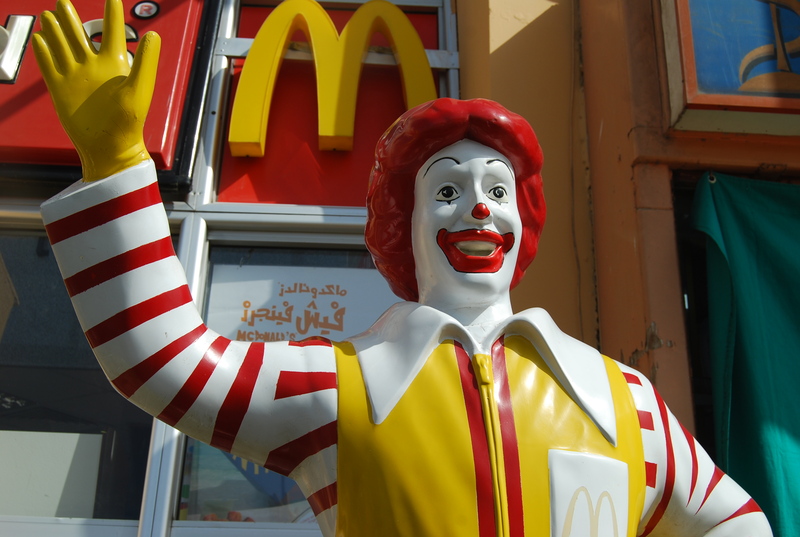 Are the markets in Egypt much different? Not really. 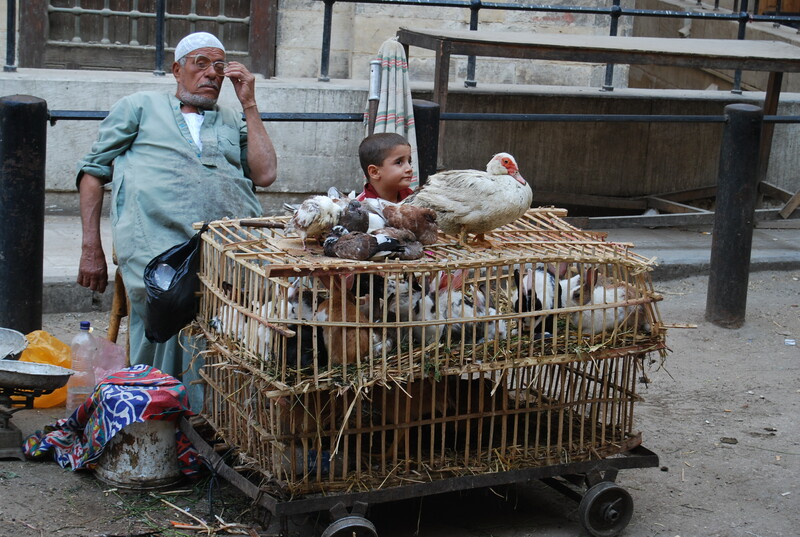 Enterprising Egyptians will sell anything and everything — from hand-picked cotton to cotton shirts and living rabbits to slaughtered chickens. 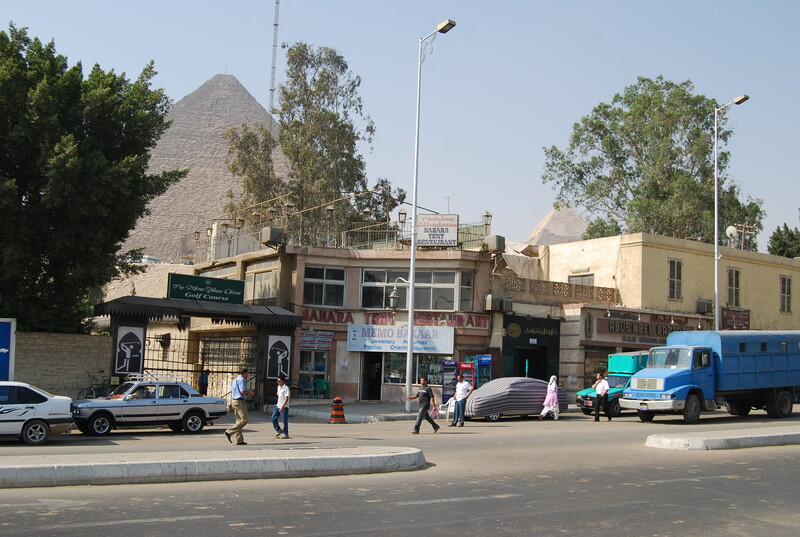 The Khan al Khalilli is the city’s largest “tourist” market with plenty of pyramid paperweights and pushy shopkeepers grabbing you by the arm to pull you into their stores (which may very well also have been Made in China). 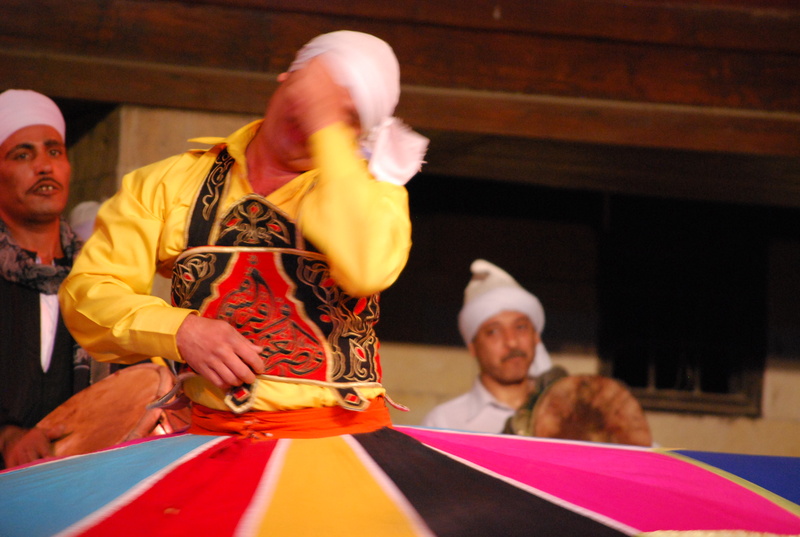 Our last stop of a busy first day was to see a traditional Sufi show. This is like an Egyptian rock concert, completely deafening, with some cheesy lighting and very cool dancing. The taxi ride back to our hotel was almost a joke. Egyptians don’t use their headlights because they want to “save energy.” It was 11 p.m. and Cairo was completely buzzing, there were hordes of people everywhere. Shops in this city seem to be organized by their merchandise type: on one street, stores were selling only car parts; on another shoes. One of my travel companions says he saw a street earlier today with just door handles — guess you never know when you’ll need a new doorknob, even after midnight. Streets are completely filthy, garbage dumps are overflowing and the air is choked with gas fumes. Egyptians drive some of the oldest, most beat up cars I’ve seen anywhere. On our way to the Islamic quarter, we saw an ambulance with its lights and siren wailing — only it had been converted to a passenger bus (perhaps it was an express). Crazy! Being on this Intrepid trip is a lot like being on an adult teen tour. There’s a leader, who is constantly counting heads, showing us meeting points and trying to impart some wisdom on a distracted audience. But traveling like this is worry-free, there’s no thinking about how to get from Point A to Point B or whether you’ve found a safe spot to eat lunch. It’s welcome after having traveled independently for the last 40 days — and it’s amazing how much you can enjoy and experience a place when the basics have been taken care of for you. It was a stressful day of traveling — starting in Santorini, where paranoid tourists furiously pushed and shoved through an interminable line at the airport out of fears that after yesterday’s strike, the only afternoon flight off this island had been overbooked. In Athens, the far from competent counter clerk gave me a minor heart attack after she couldn’t locate my reservation until she had made several phone calls in a language that’s Greek to me (no pun intended). Then, aboard an ancient EgyptAir jet, it was hard not to close my eyes and just hope that the plane would return to its motherland in one piece. 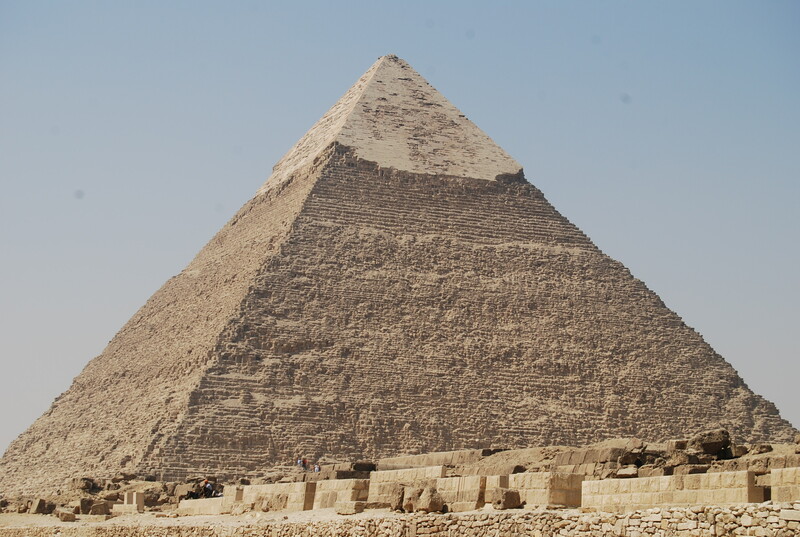 Alas, I’ve arrived in Cairo, my sixth country on this trip around the world. After buying a visa, getting stamped in and finding my backpack, it was time to brave the fast-talking cab drivers, who were ready and waiting to take me for a ride. 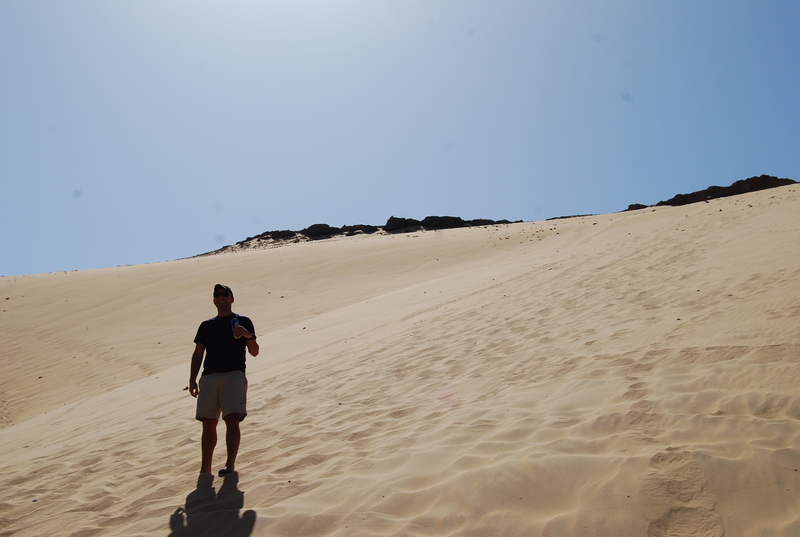 I’ve learned some lessons since Morocco — fares are always negotiable and never pay more than you’re supposed to. The touts came almost immediately: starting at 110 Egyptian pounds, or about $20USD. My magic number was less than half that. It took some persistence and haggling, but eventually I’d found my man, agreed on the 50 pound price and hopped in his junker black and white taxi. Patting myself on the back, we exited the airport parking lot, at which point my cabbie turned around and said, “You pay.” After an intense stand-off, grudgingly, my wallet was opened to fork over another 5 pounds for his parking — ridiculous, but guess you can’t win them all. We drove through the somewhat controlled chaos that is Cairo traffic. Horns are constant. There literally isn’t more than a second or two without someone blasting one — either in a friendly “hello,” or more likely, a “get the hell out of my way!” Although walking through the metal detector at the entrance to the Victoria Hotel was an ominous welcome to where I’ll be spending the next two nights, the accommodations here are actually quite pleasant. The building is over a hundred years old and has what Lonely Planet calls a “faded grandeur revamped in 1970s look.” The ceilings are high and my room, #127, is quite spacious. 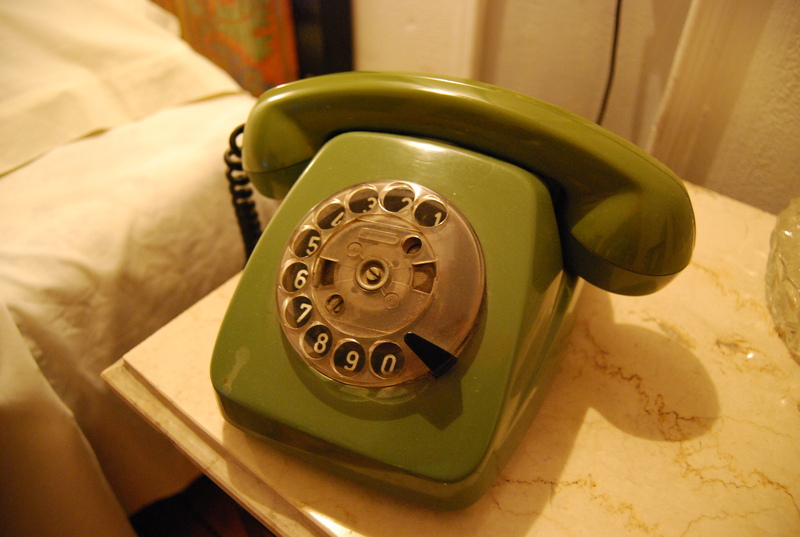 Plus, the phone is really cool and retro. These probably sell in SoHo now for like $200 bucks. After settling in and taking a little stroll around the neighborhood (note: cross streets by tailing the locals), it was back to the hotel for some dinner and a couple locally-brewed Stella beers. My trip with Intrepid through this country kicks off tomorrow morning.